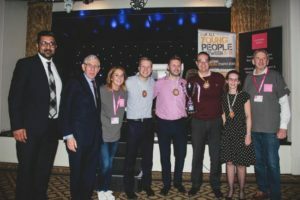 An annual charity quiz held in aid of the Blackburn Youth Zone raised £15,170 during a night of fun and games. Over 200 people from 52 different businesses across Lancashire attended the event, which took place at the Dunkenhalgh Hotel and Spa in Clayton-le-Moors. But quizzing wasn’t the only thing on the agenda, as organisers had also arranged a special performance for attendees which was put on by members of the youth zone. There was also a raffle with over 30 prizes – one of which was a piece of signed memorabilia from world tennis number one, Novak Djokovic. Winners on the night were Blackburn-based Napthens Solicitors, who were presented with a trophy and medals made by members of the youth zone. The Quiz Quest was organised by recruitment and employment specialists Cummins Mellor who are also Patrons of the Youth Zone. Managing Director Michelle Mellor said: “I am quite literally blown away by the success of our latest company fundraising effort. This year saw more support than ever with 58 teams, representing 52 companies across East Lancashire coming together to support Blackburn Youth Zone. The £15,170 raised on the night will go towards the Youth Zone’s ‘Get a Job’ programme, facilitated by the team at Blackburn Youth Zone. This programme is aimed at supporting young people aged 16 – 24 years gain the right skills for employment. Blackburn Youth Zone Chairman, Rt Hon Jack Straw who was present on the evening said,: “So many thanks and congratulations to everyone in the Cummins Mellor group of businesses.